1. I Capture the Castle (Dodie Smith) – Even with J.K. Rowling’s endorsement, this novel deserves more recognition. Quite possibly our favorite narrator of all time! 2. Bag of Bones (Stephen King) – It’s difficult to classify any Stephen King novel as underrated, but within his body of work, this novel deserves more hoopla. 3. The Eyre Affair (Jaspier Fforde) – Until every single literary minded person in the world has read (and enjoyed) this novel it will remain underrated. Sadly, one of the co-editors of this blog is still fighting the current. 4. Magic Kingdom for Sales – Sold (Terry Brooks) – We get that the whole Shannara series was way more popular, but we think the Landover series is way more better. 5. Three Men in a Boat (Jerome K. Jerome) – We just finished this novel yesterday and may still be basking in the afterglow, but this novel is seriously funny classical literature. Seriously. 6. Stardust (Neil Gaiman) – One of the Two Bibliomaniacs will vehemently disagree, but this is our (Evan’s) favorite Neil Gaiman book, although Neverwhere wasn’t half bad. 7. 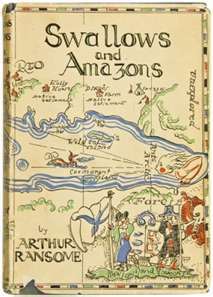 Swallows and Amazons (Arthur Ransome) – In the world of YA sailing novels, this novel stands alone. Plus the first edition cover is seriously cool. 8. Northanger Abby (Jane Austen) – Of all the Jane Austen novels, this one deserves more attention. One of her more readable novels with an underrated love story. 9. The No. 1 Ladies Detective Agency (Alexander McCall Smith) – A fantastic book with a fantastic cast of characters! 10. A Room with a View (E.M. Forster) – We’ve said it before and we’re saying it now, but the romance between George and Lucy may possibly be the most underrated in all of literature. The Eyre Affair and Stardust! Excellent choices. 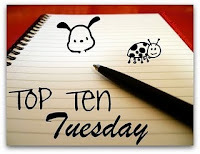 I'm not sure if I'm going to do this week's Top Ten, but if I did, those two would make the cut! So true about Northanger Abbey. And yes, that Swallows and Amazons does look and sound seriously cool! Very true about Northanger Abbey and I Capture the Castle. Both classics that too few people have read. Great list. I just stated on my blog the other day my plans to read I Capture the Castle by the end of the year. I've seen The Eyre Affair on a few lists now. Will definitely have to pick it up! I love THE EYRE AFFAIR as well as the rest of the books in Jasper Fforde's fabulous series. Also, No.1 Ladies Detective Agency. Loved it. Recently bought a nice hard cover copy of ROOM WITH A VIEW and it's sitting here patiently. Haven't read the others but I'm adding a few to my TBR list. Great Choices: I agree about I Capture the Castle, Stardust, The Eyre Affair, Northanger Abbey, The #1 Ladies Detective Agency. I forgot that Three Men in a Boat was on my TBR pile (metaphorical) so I now remember that I wanted to read it. Thanks. I love your list! I totally agree on The Eyre Affair. It's my mission in life to make sure everyone reads it (and the rest of the series). I saw Northanger Abbey on someone else's list as well, and am sad I didn't think to add it to mine. I read it earlier this year for the Gothic Reading Challenge and absolutely loved it. I'm an Austen fan, and am used to her gentle pokings at society; but this one went way over the top (for Austen, anyway), and it was brilliant. My mom loves the Detective Agency books, and she and I watched the television show when it was on. Great characters, and I loved hearing their accents (all I ever hear is Texas accents, and those aren't as cool). I think Northanger Abbey is going to be my next Austen. I also think that I need to read some Neil Gaiman. I've read the Sandman comics, but never any of his prose. Check out mine at The Scarlet Letter. I Capture The Castle has been on my bookshelf for a year, I just haven't gotten to it yet although I've heard lots of wonderful things.